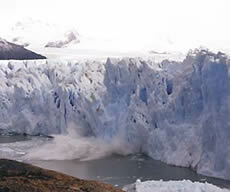 process by which ice breaks off a glacier's terminus; usually the term is reserved for tidewater glaciers or glaciers that end in lakes, but it can refer to ice that falls from hanging glaciers. glacier that loses material by calving, usually a glacier that terminates in sea, lake, or river water. A reservoir of carbon dioxide that is increasing in size. a semipermanent mass of firn formed by drifted snow behind obstructions or in the ground; also called a snowdrift glacier or a drift glacier. ice formed in a closed or open cave. 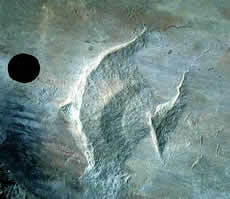 striations or marks left on the surface of exposed bedrock caused by the advance and retreat of glacier ice. 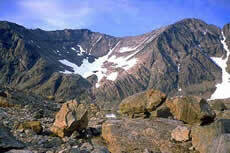 bowl shape or amphitheater usually sculpted out of the mountain terrain by a cirque glacier. glacier that resides in basins or amphitheaters near ridge crests; most cirque glaciers have a characteristic circular shape, with their width as wide or wider than their length. a principal high-level cloud type (cloud genus), appearing as a thin, white patch or layer of cloud without shading, composed of very small elements in the form of grains, ripples, etc., merged or separated, and more or less regularly arranged; most of the elements have an apparent width of less than 1 degree. a principal high-level cloud type (cloud genus), appearing as a transparent, whitish cloud veil of fibrous (hair-like) or smooth appearance, totally or partially covering the sky, and often producing halo phenomena, either partial or complete. a principal high-level cloud type (cloud genus), appearing as detached clouds in the form of white, delicate filaments or white or mostly white patches or narrow bands; these clouds have a fibrous (hair-like) appearance, or a silky sheen, or both; because cirrus elements are too narrow, they do not produce a complete circular halo. sky with a total cloud cover of less than one okta (or one-tenth in the united states). synthesis of weather conditions in a given area, characterized by long-term statistics (mean values, variances, probabilities of extreme values, etc.) of the meteorological elements in that area; polar climate (arctic climate) is generally the climate of a geographical polar region, most commonly taken to be a climate which is too cold to support the growth of trees. a study dealing with variations in climate on many different time scales from decades to millions of years, and the possible causes of such variations; (1) in the most general sense, the term climate change encompasses all forms of climatic inconstancy (that is, any differences between long-term statistics of the meteorological elements calculated for different periods but relating to the same area) regardless of their statistical nature or physical causes; climate change may result from such factors as changes in solar activity, long-period changes in the earth's orbital elements (eccentricity, obliquity of the ecliptic, precession of equinoxes), natural internal processes of the climate system, or anthropogenic forcing (for example, increasing atmospheric concentrations of carbon dioxide and other greenhouse gases) (2) the term climate change is often used in a more restricted sense, to denote a significant change (such as a change having important economic, environmental and social effects) in the mean values of a meteorological element (in particular temperature or amount of precipitation) in the course of a certain period of time, where the means are taken over periods of the order of a decade or longer. representation of the climate system based on the mathematical equations governing the behavior of the various components of the system and including treatment of key physical processes and interactions, cast in a form suitable for numerical approximation with computers. (1) in the most general sense, the term climate variability denotes the inherent characteristic of climate which manifests itself in changes with time; the degree of climate variability can be described by the differences between long-term statistics of meteorological elements calculated for different periods, (in this sense, the measure of climate variability is the same as the measure of climate change) (2) the term climate variability is often used to denote deviations of climate statistics over a given period of time (such as a specific month, season or year) from the long-term climate statistics relating to the corresponding calendar period; (in this sense, climate variability is measured by those deviations, which are usually termed anomalies). atlas composed mainly of climatological charts; it represents especially the monthly and annual distributions of the principal climatic elements of a specific region for a relatively long period. the scientific study of climate; the aspect of meteorology which studies processes of climate formation, distribution of climates over the globe, analysis of the causes of differences of climate (physical climatology), and the application of climatic data to the solution of specific design or operational problems (applied climatology); climatology may be further subdivided according to purpose or point of view: agricultural climatology, air-mass climatology, aviation climatology, bioclimatology, dynamic climatology, medical climatology, macroclimatology, mesoclimatology, microclimatology, paleoclimatology, synoptic climatology, etc..
ice formed in a closed space, cavity or cave in permafrost. composed of close ice that is mostly in contact; ice cover 7/10ths to 9/10ths. a layer or body of unfrozen ground occupying a depression in the permafrost table below a lake or river. freezing that occurs under conditions that preclude the gain or loss of any water by the system. a pingo formed by doming of frozen ground due to freezing of injected water supplied by expulsion of pore water during permafrost aggradation in the closed talik under a former water body. a hydrometeor consisting of a visible aggregate of minute particles of liquid water or ice, or both, suspended in the free air and usually not touching the earth's surface; it may also include larger particles of liquid water or ice (precipitation particles) and non-aqueous liquid or solid particles such as those present in fumes, smoke and dust (aerosols); cloudiness is the same as cloud cover; but usually it is used in a very general sense. that portion of the sky cover which is attributed to clouds; the unit of measurement is the okta or tenths (meaning one-eighth or one-tenth) of the sky dome as seen by the observer. decrease in volume per unit volume of a substance resulting from a unit increase in pressure, under isothermic conditions. any non-occluded front that moves in such a way so that colder air replaces warmer air; the leading edge of a relatively cold air mass. glacier in which most of the ice is below the pressure melting point; nonetheless, the glacier's surface may be susceptible to melt due to incoming solar radiation, and the ice at the rock/ice interface may be warmed as a result of the natural (geothermal) heat from the earth's surface. at a given level in the atmosphere, any low that is generally characterized by colder air near its center than around its periphery; the opposite of a warm low. the location that has the lowest annual mean temperature in its hemisphere. that portion of a peatland where the whole or part of a palsa or peat plateau has thawed and collapsed to the level of the surrounding peatland. a wedge showing evidence of both primary and secondary filling. flow that occurs when glacier motion is decelerating down-slope.